Jitney work involved taking the truck back and forth on Dundas Street carrying people to and from the Woodstock Fall Fair at five cents per person. A street car operated by the Thames Valley Electric Railway ran along Dundas Street. At this time it went through to Ingersoll so did not offer much competition on trips to and from the fair grounds. There were ten school fairs over two weeks at various places in the county. The job involved helping to set up a fairly large tent as well as folding tables along the sides and up the middle. The children displayed all kinds of vegetables, cookies, handwork, samples of writing, artwork, etc. The tent was closed until the judging was finished in the early afternoon. It was a great day with keen competition for the red, blue and white ribbons. Fred Bigham did this school fair job for many years. Assisting in the judging and making many good friends, he enjoyed the two weeks almost as if it were a holiday. These entries recall a major ice storm. The ice took down the main long distance lines along Devonshire Avenue, then known as the 2nd Concession North. At that time, the large poles carried about six arms loaded with wires. It was a mess for miles and Fred was employed for weeks taking the Bell Telephone men and equipment to the job site. Jan.7 Doug Bruce & Glen Rowe. (One weeks board. Fred made these nursery deliveries spring and fall for a relative George Veale who travelled around with a horse and buggy taking orders for fruit trees, bushes and other nursery products for as long as he was able. George was a brother to Fred’s mother Emily Bigham and grandfather of George Howe who subsequently worked for us during the 1939-45 War and married Bigham The Mover’s first secretary, Alice Nixon. Mr.Waghorne built and operated a bakery at 202 Wellington Street North, later to become Bigham’s office and furniture warehouse. This entry indicates that Fred’s tire business continued with the basement at 243 Riddell being the work shop where the sponge rubber tubes were put into the tires. Fred worked very hard at this as one can imagine installing the sponge rubber tube tight enough so the tire stood up as it inflated with air. The demand for truck transportation was increasing and Fred arranged to replace his Model “T” with a Reo Speed Wagon. This was a great improvement as it came equipped with a new passenger top and seat cushions. The rear of the garage at the house was being extended to make it long enough for the new truck. This Mr.Powell later bought a large International truck with hard rubber tires to compete with Fred. Also, a Mr.Walton and son bought a Ruggles truck made in London and entered the trucking business in the area. Many others came and went but Fred persevered and weathered this competition. Fred’s Aero tire business was diminishing. They rode very hard and tire companies were building better tires with inflated tubes. Moreover, Fred had virtually stopped both selling insurance and installed weather stripping possible due to being kept very busy with his trucking business. In the early 1920s there were no trucking regulations and no buses so he could haul anything anywhere – apples, chickens, animals, furniture, railway ties and people and he did. Alter hauling a load of pigs, for instance, Dad washed the truck out on Riddell St. and then sprayed the inside with formaldehyde – now he was ready to put the top on and carry a load of passengers. In December 1925, Fred dealt his first Reo Truck for an even larger truck with dual wheels. This truck was also equipped with a fitted top for passenger service and a wide cab so that you could lie down on the seat and the back could be hooked up to the top to provide a second berth. The first trip this truck made involved moving Fred Webber from his farm north of Hickson to New York City! Fred Webber joined other members of his family who ran a successful car sales business. One again, the garage at 243 Riddell was extended by adding six feet to the front. It was snug but the truck fit. In June 1927, another truck, a second hand Reo, was purchased from Comet Transport. It was the same size as the other Reo with a similar wide cab. Since turning fifteen in 1925, Fred’s son Gordon had been working at Clayton Bros. bicycle store before and after school and on Saturdays. 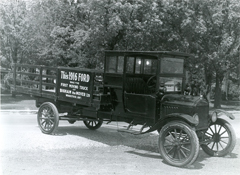 In 1927, Gordon began to work full time and Earl Clayton left the store to drive Fred’s second truck. There appears to have been ample business in these years with Fred, among other work, hauling loads of chickens for Oxford Farmers Co-op and Mr. Blumenstock to the Buffalo market at $50.00 per trip; trucking veneer for Hay & Co. to furniture factories in Owen Sound, Chesley and Walkerton among others; and carrying loads of casting to Kitchener for Eureka Planter. But, there was no place to keep the second truck. As a result, a piece of property was purchased from Fred’s mother at the rear of 216 Light and a garage with room for five vehicles and a full basement was built facing onto Admiral Street. At the same time, a house at 220 Graham was bought to be closer to the garage and the house at 243 Riddell was to be sold. It did not sell immediately and it was rented as a temporary measure. In October 1929, just prior to the stock market crash, Fred changed the 1925 Reo for a heavier and larger Reo truck, formerly owned by Ingersoll Machine & Tool Co. Certainly, the stock crash ended any chance of selling 243 Riddell Street because prices had dripped so drastically. Instead, the home was rented for as little as $20.00 per month. Each home was mortgaged for $2,000 at 5% and 6% respectively and the rent was just enough to carry the expenses on the Riddell Street house. The cartage business had not improved with Fred working alone most of the time. Total revenue for 1931 was $3,300 followed by $4,100 in both 1932 and 1933. This is a sample of work done in those times of economic depression. Sept. Loading Conklin Shows – 4 hrs. The trucks were getting older while the economy showed little promise of improving. Gordon realized that the better moves were going to covered vans. In 1934, a decision had to be made – either quit the moving business or buy newer equipment. Frank Cronin was the International machinery and truck dealer. A quote on a new truck from him carried a promise with it of hauling machinery and twine from Hamilton to London for International Harvester. In addition, prices on trailers were obtained from Dominion Truck Equipment in Kitchener and Truck Engineering in Woodstock, Vern King was just starting in business and sat on a nail keg in the garage talking to Fred about the trailer. The two prices were similar but the decision was made in favour of Dominion Truck Equipment for a 1000 cuft.van, the largest on the road at that time, for $2,100. A tractor was purchased from Mr.Cronin for $1500. and the old Reo truck was traded in for $500. Fred did not have the cash for this transaction so he proceeded to borrow on his insurance and from family members. It took a long time to pay this back. Spring 1935 and the company was on the road with the very finest equipment and they did start to get the better trips. On some trips through towns, people would literally stop and watch the truck pass – it was a smart looking unit. On one trip to Montreal that spring, they arrived in Cornwall only to learn that the frost law in Quebec was such that they could not travel on their roads even with the trailer empty. Gordon and his helper, Cecil slept in the van over the weekend and bought meals for the grand sum of 25 cents each. On Monday morning, work came that if they went to the provincial border at Lancaster ad north to Hwy.17, they could get into Montreal. They delivered the load and picked up a shipment for Kitchener. They got back into Belleville in the early hours of Tuesday morning very tired and with only room for one to sleep in the van. However, there was a work bench with a shelf in a Cities service station and that was where Gordon slept. In order to increase load weights, Fred built a heavy two wheel trailer, called the “Pup”. to pull behind the stake truck. This could haul about two extra tons. This truck brought barrel staves from Guelph and veneer from the Wood Mosaic to the Oxford Fruit Co-op to construct apple barrels. The finished barrels were delivered to area farms, 120 to the load. A high rack was built to allow the barrels to be loaded four high. More than one telephone line was pulled down by the high rack and if you didn’t notice low tree limbs that rack got broken. Bigham’s gasoline contract was with Canadian Oil Co. and as a result they got some business from them hauling drums of oil from Petrolia. To make the trip worthwhile, they needed a trailer that could accommodate heavier loads. Fred located a 16′ stake trailer in London and purchased it from Husband Transport for $300. The trailer was quite suitable although the C-35 International Tractor really lacked enough power to handle the job well. On into 1936, Fred was booking more furniture moves but with only one covered van customers were disappointed if you arrived at their door with the alternative tarp covered truck. Early in 1937, Fred & Gordon purchased a used 1929 800 cuft. Reo van from Creasy Movers for $600.00. Fred drove it home from Windsor and it was repainted and lettered in our garage to match the Dominion van. Holman Machines had started up on the site now occupied by the Standard Tube #2 Plant. It was an English company manufactured mining equipment.. Bighams moved the manager, Mr.Dutton and their office equipment from Montreal to Woodstock. One of their shipments of mining equipment enroute from England to Singapore was re-routed to Woodstock because on Pearl Harbour. Many tons of this crated machinery were in Bigham storage until after the close of the War. Holman’s proved to be a good contact as they were tooling up to make shells for the war. They were to build a smoke shell which was in two pieces and it had to go to Sawyer Massey in Hamilton to be welded and then returned. A hauling contract was discussed with Mr.Dutton making use of the “C” licence and stake trailer. Six boxes of shells were to be set on and off by an overhead crane with a total shipping weight of nine tons. A new set of tires for the C-35 International tractor were purchased and Gordon and a helper left for Hamilton on a test run in the afternoon of the day just before Good Friday in 1941. They carried a set of blocks in the event they had to stop on the Hamilton mountain because the mechanical brakes had never been completely reliable. Gordon recalls telling his father Fred that the tractor didn’t have enough power to make the trip, but that there were no new trucks available due to the war. The next day Fred and Gordon went to London to look at used trucks. They stopped at London Motor Products and found that they still had one new tractor and it was the right size. They purchased it and drive it home the same day. It did an outstanding job throughout those war years and as an aside, it was the only truck they ever b ought on the GMAC monthly plan. This new tractor was put on the shell job and made one or two trips to Hamilton every day. A little later, Fred replaced the C-35 tractor used on the furniture van with a used D-40 International purchased in Toronto. Our $300 stake trailer was the next problem and again new trailers could not be bought. However, Dominion Truck Equipment in Kitchener said they could rebuild it for us. So a 16′ trailer become a 24′ trailer with only the original dolly wheel set up included – this classified it as a rebuilt unit. Once finished the smoke shell were put into metal boxes with about twelve to a box. These boxes were stored in the old Canadian Furniture Mfg. plant on Mill Street and taken by Bighams to Holmans to be filled with the empty shells and then to Ajax to be loaded before being shipped overseas. During these war years, they also had two furniture vans operating at fixed rates of $2.50 per hour for the van and two men as well as two pickup trucks making deliveries for up to twelve local stores. The stores were unable to get gas for their trucks due to gas rationing. Our largest delivery job was for Dominion Stores with up to six hundred deliveries a week, starting as low as ten cents a stop. Holmans next contract was to manufacture a 12 lb. shell. These came by rail from the Atlas Steel foundry in Welland. Our job initially was to load these shell, stacked on the floor about six inches deep from the railway car only to unload and re-pile them at the plant. It was a back breaking job. Meanwhile, various carriers were trying to get the contract to haul these shells but Atlas Steel said no one could get in to load because of certain pipes they would have to drive over in their plant area. Some very heavy snow falls delayed delivery by rail and Mr. Dutton called Gordon and asked “How soon could you get a load in for us. We are not going to have enough to keep the plant running”. It was operating on a twenty-four hour basis. Gordon told Mr. Dutton that if they could get permission to get in at Welland that Bigham could certainly have forgings there sooner than by rail. There was a phone call to Welland by Mr.Dutton and truck clearance was given. They drove to Welland, past the guards and right into the plant, with no problem. They were on their way back with the shells in no time. This marked the beginning of another busy period. In order to increase the payload, the regular truck racks were replaced with racks with planks that were held in place by short stakes. This permitted the truck to carry one more ton. Sometimes they had more than they could handle on this job and on occasion arranged with Lowes Transport (who were hauling lime to Welland) to return to Woodstock with a load of shells. It was nip and tuck keeping enough shells in stock for the three shifts at Holman’s. Bigham drivers would phone from Welland when they were loaded, regardless of the time of day or night, and Gordon would phone the plant to indicate when the next load could be expected. This job continued until the close of the war and in fact the truck was in the parade on V.E. Day still loaded with shell forgings. During the same period, Fred purchased the Geo.Bezley Trucking firm and operated it as a partnership under Bigham Transport. That business largely consisted of a Diamond “T” tandem straight truck hauling cheese from area factories to the Kraft cold storage in Woodstock and from there to Toronto. In addition, Bigham Transport assisted in hauling shells from Welland to Holman’s. Road conditions were impossible during the height of some winter storms and on one occasion they were stopped overnight at a service station just outside of Welland. In the morning, the truck would not start and a fire was actually started under the motor to warm up the oil. It worked but what a risk! In 1937, Fred had rented the first floor of the Weston Bakery building at 101 Wellington St. N. for storage. That space seemed to be more than enough but in 1938 the second floor became available with a firm who manufactured electric windshield defrosters discontinuing its business. The rent for the two floors was $45.00a month. It was a satisfactory arrangement although the building was in bad shape with its roof leaking, some windows boarded up and its coping around the top of the building so loose it was dangerous. In a heavy rain, they had to go to the warehouse and put out numerous tubs and pans to catch the leaks. Then, Weston’s indicated they would sell the property to Fred but he saw no use for the barn on the same site and the large low lot east of it. He made them an offer on the main building but it was no sale unless he took the whole property. Taking it all meant higher taxes. Fred made a second offer for the entire property at $600.00 less than the original offer for the main building only. It was accepted with provision for Weston’s to continue to use the stable, shipping room and office at $22.00 per month. Fred moved the office from the house at 220 Graham Street and shared the office space. One of the first changes was to remove the large Weston baking oven. Twenty thousand bricks later the first floor was ready for furniture storage. Many of these bricks were sold and others used to repair the brick work around the top of the building. The boarded up windows were replaced and sixty-five pounds of putty held them in place. The elevator to the second floor was operated by a gasoline car engine installed on the second floor. There were no elevator inspections in those days! As the war continued demand for storage increased and the two floors were full. A store at 375 Dundas was rented and later another, at 682 Dundas to provide supplementary storage. The basement of the warehouse had a dirt floor. It was to become the next space. A cement floor was put in, everything was swept down and white wash unit cleaned up the ceiling and walls. Wiring was installed and hot water radiators hung from the ceiling. Fred built a brick wall to close in the boiler room. A dirty steam coal was used in the boiler and hand fed by an employee who occupied a small apartment on the second floor. He also kept the horses fed and watered for Weston’s and while continuing to do this until horses were replaced by bread trucks, he looked after the boiler as well as the lawn and shrubbery. Later, an automatic stoker was installed. Each fall the coal bin was filled with about thirty tons of fine stoker coal. In order to keep the basement dry, heat on the main floor was cut off during the summer, leaving heat to the basement only. As this basement space filled up with storage, Vance Construction was asked about building a third storey of brick but they indicated it was not feasible. The building would simply not stand the weight. As an alternative, Fred talked to Chalmers, Barnett & Quant about a frame construction with a roll brick siding. In April, 1942, trusting there would be no rain, the coping around the top was opened and during one week of beautiful weather, the third floor was built complete with its roof. Moore Elevator of Kitchener came in and installed another elevator to provide service from the basement to the third floor for $2,500. This renovation provided another 4200 square feet of storage space. It was virtually filled at all times for the next thirty-five years. Meanwhile, in May 1945, World War II ended. The price freeze on rates was removed but so was our contract to haul shells. Strictly in business terms, that contract had made those years much better for us than for many movers. The Ontario Movers were meeting regularly and at a meeting at Diana Sweets Restaurant on Bloor Street in Toronto there was a lot of discussion on the prospects of the post war years. Mr. Rawlinson, who never said a great deal, got up and said: “Following the First Great War, the movers never had it better and I predict a similar turn around for us at this time.” He was right as a building boom started and the moving business grew more or less steadily for the next thirty years. Everyone was happy to see the war’s end but closer to home on May 24, 1945 Bighams had another happy event. Years before, Fred’s Model “T” truck was sold but he always knew where it was, a farm near Embro. It was in the farmer’s drive shed and had not been used on the road since 1933. He sold it back to Fred for $25.00. Fred pulled it out of the shed with the farmer’s tractor and put in a battery, water and gas. It started with no trouble although the radiator hose connections were rotten and they had to take on water at every creek on the way home. Fred really enjoyed the trip home and it was a 24th of May to be remembered. The truck has been used in numerous parades as well as displayed at Yorkdale Mall and twice at the antique motor show on the CNE grounds in Toronto and Norwich antique show. Of course, it is always looked for in the 24th of May parade in Woodstock. In January 1945, Bigham the Mover was registered as a legal partnership between Fred and his son Gordon. It was a very important step and assisted by Mr.MacQuarie, the auditor, it proved to be a happy and successful arrangement. Just following the war, Willis Bigham (Gordon’s brother) left for Toronto and took a job at Rawlinsons. Bigham Transport was dissolved. Gordon MacKay bought the Class “C” license. Norm Schell purchased the Diamond “T” truck and Bigham the Mover bought spare tires and other assorted equipment as well as the cheese hauling business. New vehicles were again coming through and Fred purchased a new Chevrolet Sedan for $1,615. They also bought a new GMC tractor to go with a new 28′ Fruehauf trailer (#20). In the midst of these purchases, Mr.MacQuarrie cautioned Fred on a possible let down in business but fortunately, that was not the case. Later they had the 1935 Dominion Trailer, the first covered van lengthened from 21′ to 24′. In 1951, a five year old 31′ Fruehauf trailer was purchased from Kennie the Mover in Windsor. It required complete reskinning, new tires and brake work. Alex Walker and our men did the job in the Bigham garage using new aluminum siding and it was the first unit to be painted in regulation Allied Van Lines (AVL) colours. Bigham the Mover became an incorporated company on December 31, 1951. Following that and again under the guidance of Mr. MacQuarrie, Fred and Gordon began discussing putting the major control of the business in Gordon’s name. He purchased Fred’s shares in September, 1952 leaving a voting share with Fred and his wife. Fred continued to have a modest salary, a company car and other personal benefits. Gordon was to pay interest at 5% on the purchase value of his shares. During the next few years, Fred’s eyesight began to fail due to glaucoma and that limited his activities. However, with the aid of a large magnifying glass he continued to make up bills in the office. He was in the office regularly and certainly, even his presence contributed a great deal. Then on July 14, 1954 the last of Gordon and Hazel’s four children, Howard Thomas, was born. Prior to his arrival, they had decided that although they had added three rooms to the rear of the house back in 1945 and subsequently extended the living room at the front, there just was not enough bedrooms for the family with four children. They looked around for another house but finding nothing to their liking the upstairs apartment at 243 Riddell seemed to be the answer. The kitchen units were taken out, the rooms repapered and presto, there was lots of room for the growing family. Gordon had been visiting the purchasing agent, Max Hart, at Metal Fabricators frequently because of other deliveries and the prospect of moving a large order of hospital furniture to the new Saskatoon Hospital was mentioned. Bigham’s quotation was in but the discussion as to whether the order was to be carted and go by rail or go by furniture van had no been made. Gordon recalls it was almost lunch time when the decision was made to go by van. It was the largest single order that had ever been booked by Allied Van Lines at that time. This order plus a supplement ran from the fall of 1954 through 1955 and into 1956. Bigham hauled about one half of the order with other AVL units taking care of the balance. This was done with #28 and #31 trailers travelling an all Canadian route although portions of that route had not yet been paved. At one place, the only bridge was across the top of a dam and the turn on to it was so short that even our 28′ and 31′ trailers had to be worked around by backing up and going forward several times. During 1955 they added a new 34′ Trailmobile. With more capacity than the other trailers, it served well on these western deliveries. Also in 1955, a GMC automatic transmission tractor was purchased to replace a tractor which had blown a motor coming into North Bay on a return trip from the west. The new tractor was loaded onto the stake trailer and taken to North Bay. The units were exchanged and the new tractor and trailer continued on to Ottawa to deliver the weight. In the later 1950’s, school desks by the thousands were ordered from Standard Tube in Woodstock for the new schools throughout Ontario. To meet all their orders, Standard Tube produced the desks well ahead on the delivery date. As a result, they had to move hundreds of desks into storage in the early summer and deliver them later. Every available space was filled in the warehouse. Standard Tube rented the Badminton Club on Hunter Street as well and it was filled with desks stacked three high. On numerous occasions, deliveries to a school were requested too early – sometimes even the roof was not in place and on one delivery in London the men could not find a school at the given address – it had not been built yet! The business continued at a steady pace with very little change. Gordon had inquiries and offers for both the property at 202 Wellington St. N. and the business itself but none seemed to be right. However, he sensed some change would be necessary before long. Gordon’s son Howard started at University of Western Ontario in September 1973 with engineering in mind but during the year decided to shift for his next year of studies into business administration. For two years he lived with three other fellows in an apartment and then in his third year with John and Beryle on Santa Monica. At the end of his first year, he said to Gordon “I wonder what you’d think of my taking over the business. I could stop and start with you now”. Gordon’s response was “I’d like you to finish your university first”. Gordon had had a number of inquiries for the business but this gave him something to look forward to. 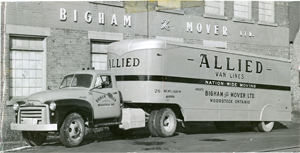 During the 1970’s, while Bigham booked moves to western Canada, they generally gave the hauling to other Allied Companies. If they were going to get involved in these long hauls, they needed a larger van and possibly a diesel tractor. New equipment would cost about $50,000. They decided instead to look for used units. After phone calls, trips and considerable inquiry, only one possibility of a 40′ trailer turned up. Gordon Carr at Tippet Richardson had located two vans in Richmond, Virginia. Howard was off from university for a few days so they made a quick trip. The result was a 40′ Fruehauf van in AVL colours for $2,500 US dollars delivered to Buffalo. With the exchange and duty this translated into a cost to Bigham of $3,500. Meanwhile, a one year old GMC diesel tractor had been purchased from a rental company in Toronto for $10,500. Howard commenced work at Bigham The Mover immediately after his graduation officially taking over as President on July 1, 1977. The legal transfer of the business and the stock took place at that date. Howard and Margaret had purchased their first home at 23 Oxford Street on June 10, 1977 and on November 23, 1977 Rebecca Amy was born at Woodstock General Hospital. Daniel James came along on November 20, 1980. Most recently on September 15, 1983 Hannah Beth was added to their family. Back at Bigham The Mover. In July 1978, Utting Real Estate made an offer on the property at 202 Wellington Street N. giving Howard until March, 1979 to name a closing date. The offer included an inflation addition up to the date of closing. Although they looked a several alternative buildings nothing suitable was available. A property with buildings at the corner of Parkinson and Springbank Ave. S. was empty but the buildings were neither large enough nor appropriate for the company. However, there was vacant land on the property that could be severed and developed. The property was purchased and the section with buildings put up for sale. It was bought abut a year later by Western Plumbing Supply. During that year, Bigham was getting quotations on the construction of a new building with the contract being let to XDG of Kitchener for a 60′ X 125′ building with steel frame and siding. The ceiling and walls were to be fully insulated with 6″ of insulation. Edwards fire alarm system was installed to ring directly to the fire hall. A gas furnace was to heat the office and passive infra-red gas fired units were used in the warehouse itself. Routenburg’ took the contract to develop the property which required the removal of a great deal of earth and the gravelling of the yard and the approaches from both Springbank and Parkinson Streets. During the winter of 1979, Bigham employees built 100 storage containers for the new building in the basement of the old building at 202 Wellington Street N. To move to the new building the containers were assembled on the main floor and about twenty at a time were filled. Then, these containers were fork lifted onto a flat bed trailer, rented from Ed Hamilton Cartage and set in place in the new building. The first load went into the new building in August, 1980 and the whole move was completed in early October. Bigham the Mover opened for business at the new location in October, 1980 and held an official open house on January 17, 1981. The warehouse as designed has been found to be an excellent facility. It holds 132 containers with the section over the offices fitted with racks for sofas and chairs. The summers of 1984 and 1985 have seen the building full to capacity which, at times, has left them wondering what the next move for space will be. During 1984, Standard Tube furniture division was closed which ended our fifty years of association with them. In the last thirty years, Bigham has delivered thousands of their school desks, staking chairs and folding tables throughout Ontario. They were a great company to work for. Now to supplement the regular moving activity, a new business is emerging hauling computer equipment for a firm in Cambridge. 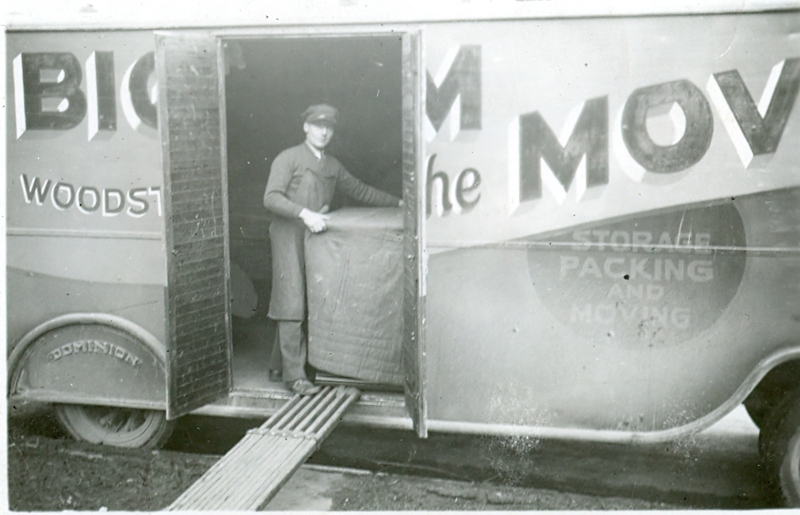 Bigham The Mover has adapted to change for over 90 years.